Bonprix UK has launched its Spring 2019 advert, highlighting that it’s time to enter the new season with denim trends and monochrome tones. The 30-second spot features several women showing off their dance moves while rocking styles from the new collection, such as a black and white midi dress, black trousers paired with different blouses, skinny jeans and wide ankle jeans, as well as a denim dress. 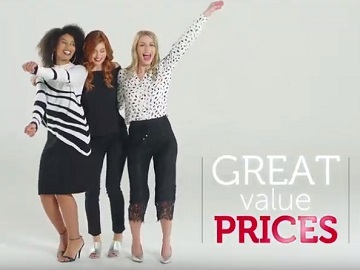 “With sizes ranging from 6 to 32, thousands of amazing styles to choose from, and great value prices, get set for this spring season with the latest collection from Bonprix,” the voiceover says, urging viewers to visit the brand’s website. The advert also informs that you get 25% off and free standard delivery on your first order when you open a Personal Account.